← Shine Up Your Apple Watch. Apple Pay Has Added More Canadian Banks To Its Roster. And, I put this practice to good use when Apple accidentally sent me two watches when I, in fact, was waiting for one to arrive. I purchased my Apple Watch Sport while on vacation in Florida. Two weeks later, as we were literally leaving our rented villa, the Apple Watch started to “act up”. The passcode kept popping up non-stop, it wasn’t synching – you name it. And, as you all know, the timeline for returns is – you guessed it – two weeks. So, since it was 7:00 in the morning and we could not delay our long trip home, I just tinkered with it and managed to get it to function once again. Yay me – or so I thought! Within days of arriving home, the Apple Watch started to malfunction. Nothing worked. Not only was the passcode popping up numerous times, but also I was no longer receiving notifications. Plus the synching problems escalated. So, I went on line with Apple Support. Three times. Count ’em three. And, like the saying goes – “three’s a charm“- this particular tech support employee came to my rescue. He immediately sent me a new watch and instructions on how to return the defective one on my wrist. It worked like a charm. All was good. A second watch arrived in the mail. Huh? Where did Watch Numero 2 come from? My credit card wasn’t charged twice and, even more strange, there was no invoice with this second watch. Just the watch. In a box. Sent to me by who knows who? Well, I enjoyed the situation I was in for a day or so but then my conscience kicked in and I phoned Apple. That’s when the fun began. After being transferred to numerous higher level Apple reps – because, I guess, they don’t have a department to deal with people who wish to return a product they didn’t pay for – everything was straightened out. And – they wished to send me a gift for my trouble. Wow. Now that was exciting. A gift from Apple is better than the extra watch. It seemed more personal and also respectful in regards to excellent customer relations. 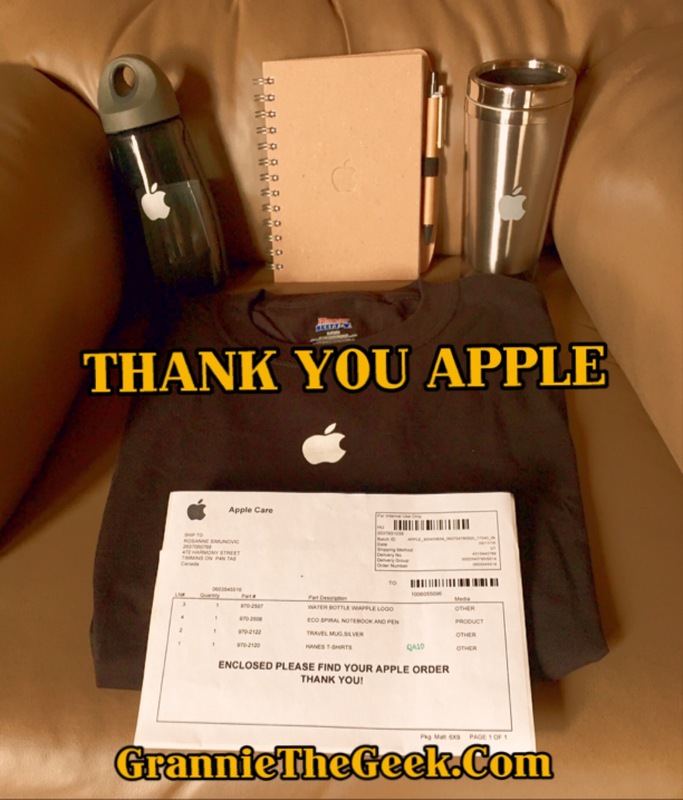 So, as you can see from the picture above this article, I received an Apple water bottle, thermos, t-shirt and journal. Very cool. I was like a kid in a candy store. Seriously. It made my day. Now, I know some of you would say – why didn’t they let you keep the extra watch? Uhm – maybe because it would set a precedent? I never expected that to happen but I really didn’t expect the gift either. In the end, I could sleep better at night knowing I did the correct thing – and that is what made the difference to me in the way I like to go about my life. So thanks Apple for respecting your customers so much. It’s nice to know that good, old-fashioned customer service is at the top of Apple’s to-do list every day. Oh, and by the way, I have made it a habit to purchase Apple Care for all my Apple Products. It’s a small price to pay for the safety, security and longevity of your device. Extra Bonus – My 10-year-old granddaughter was pretty proud of her grandmother. 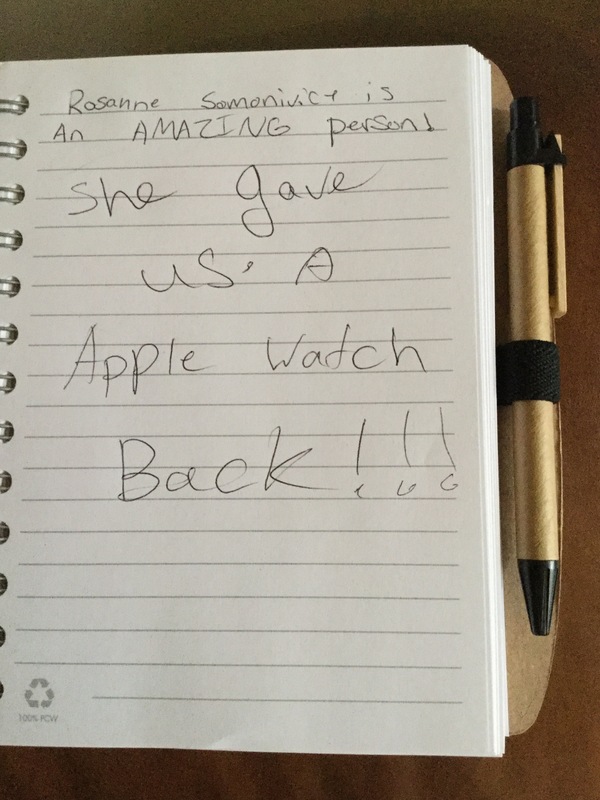 She christened my Apple Journal with this note. A couple of grammatical/spelling errors but who cares, right? It’s the thought that counts. Posted on May 27, 2016, in Apple, Technology. Bookmark the permalink. Leave a comment.